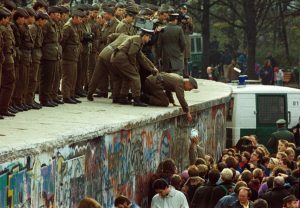 On October 3, 1990, less than one year after the Berlin Wall came down, East and West Germany came together on what is known as “Unity Day.” If you’re of a certain age, you remember how exciting that time was, when the world seemed to be changing overnight. The Berlin Wall surrounded West Berlin and prevented access to it from East Berlin and adjacent areas of East Germany from 1961 to 1989. Built as a barrier by East German authorities in an effort to stem the steady loss of skilled workers, professionals and intellectuals from East Germany to West Germany, the original wall was built of barbed wire and cinder blocks, then replaced by a series of concrete walls that reached up to 15 feet high. Topped with barbed wire and guarded with watchtowers, mines and gun emplacements, the wall was further fortified by the 1980s into a system of walls, electrified fences and fortifications that extended 28 miles through Berlin and extending an additional 75 miles around West Berlin. If you think this sounds scary, it was. This post from The Guardian contains photos and memories from people who witnessed first-hand living with the wall. The swift downfall of the German Democratic Republic was triggered by the withering of other communist regimes in eastern Europe and the Soviet Union. Erich Honecker, leader of the German Democratic Republic, had been in power since 1971. However, Soviet President Gorbachev’s liberal reforms struck a nerve in the Honecker regime, which by 1988 was forbidding the circulation of Soviet publications within East Germany. In the summer of 1989, however, the wall was in effect breached when a reformist Hungarian government started allowing East Germans to escape to the West through Hungary’s newly opened border with Austria. East Germans by the hundreds followed this route, with others seeking asylum in the West German embassies in Warsaw and Prague in an attempt to emigrate to West Germany. In an effort to halt this flow of people, Honecker was deposed in mid-October and replaced with a hard-line communist, Egon Krenz. However, on the evening of November 9, a communist functionary mistakenly announced at a televised news conference that the government would allow East Germans unlimited passage to West Germany, effective “immediately.” What he meant to convey was that East Germans would be required to apply for exit visas (and during normal working hours only). However, his message was interpreted as a decision to open the Berlin Wall that evening. Crowds gathered, demanding passage into West Berlin and unprepared, the border guards let them through. Tens of thousands of East Germans poured through the crossing points in the wall and joined rejoicing West Berliners on the other side. There would be no turning back now and the opening of the Berlin Wall proved to be the fatal blow to the German Democratic Republic. Demonstrations continued and in mid-November 1989, Krenz was replaced by Hans Modrow, who promised free, multiparty elections. The Party of Democratic Socialism suffered a crushing defeat and the new East German government began negotiations for a treaty of unification. By July, 1990 there was a monetary union of the two Germanys and Gorbachev dropped his objections to a unified Germany within the NATO alliance (in return for sizable West German financial aid to the Soviet Union). The unification treaty was ratified and went into effect on October 3, 1990. The Berlin Wall had stood as an icon for the economic and political division between East and West. In a 1946 speech in Fulton, Missouri, Winston Churchill said “From Stettin in the Baltic to Trieste in the Adriatic, an iron curtain has descended across the continent.” This speech is considered one of the opening statements to the Cold War and made the Berlin Wall synonymous with “The Iron Curtain.” For many, the reunification of Germany effectively marked the end of the Cold War (although the dissolution of the Soviet Union wouldn’t happen for more than a year). This October, we welcome you to reflect on your own memories of the Berlin Wall and the Cold War, as well as the fall of the Berlin Wall. We’ve also created this LIST to bring together some of the music, books, and films from 1989 and 1990.